Peer-to-peer (P2P) lending has come a long way since it entered the market as an alternative form of financing, especially during the aftermath of the 2008 global financial crisis. Banks steered clear of riskier consumer and small business lending due to higher capital requirements and pressure brought on by bad debts in the banking system. Now, more than a decade, P2P lending has thrived with an influx of alternative lenders globally offering higher rate of return on savings and lower rates on lending – leveraging on new technology and big data. China has been in the centre stage of the development of the industry in Asia Pacific due to its large scale and the controversies and frauds that pushed China’s authorities to impose rules to more than 2,000 online lenders in the country. However, Southeast Asia has also become a market to watch out for particularly driven by activities in Singapore. Singapore is one of the fastest growing economies in the world and it is home to small and medium-sized enterprises (SMEs) who have limited access to financial credit. According to Singapore Department of Statistics, there are a total of 220,100 enterprises responsible for employing 65% of the 3.4 million strong labour force and contributing 49% of the $306.1 billion (S$402.7 billion) of nominal value added to the economy as of 2017. However, SPRING Singapore, an agency under the Ministry of Trade and Industry responsible for helping Singapore enterprises grow, reported that 35% of SMEs have cited financial concerns, an increase of 13% from last year. Among these SMEs with finance-related issues, “Higher Interest Rates for Bank Loans” was raised as a priority for 29% in 2017, compared to 46% in 2016 and 43% in 2015. In response, around 60 platforms have already begun operating in the P2P lending space to take on the market which is being underserved by banks. In 2016, the total alternative finance volume in the country amounted to $124.47 million (S$163.75 million). With the expanding industry and the influx of new players in the lending space, some platforms struggle to differentiate themselves and eventually sustain their operations as well as scale their businesses. SME financing has often been under-served by traditional financial institutions due to structural challenges, many of which are shared by P2P financing firms. Realising these challenges, co-founders Reynold Wijaya and Kelvin Teo have taken an active learning approach towards aligning difference pieces of the business model. 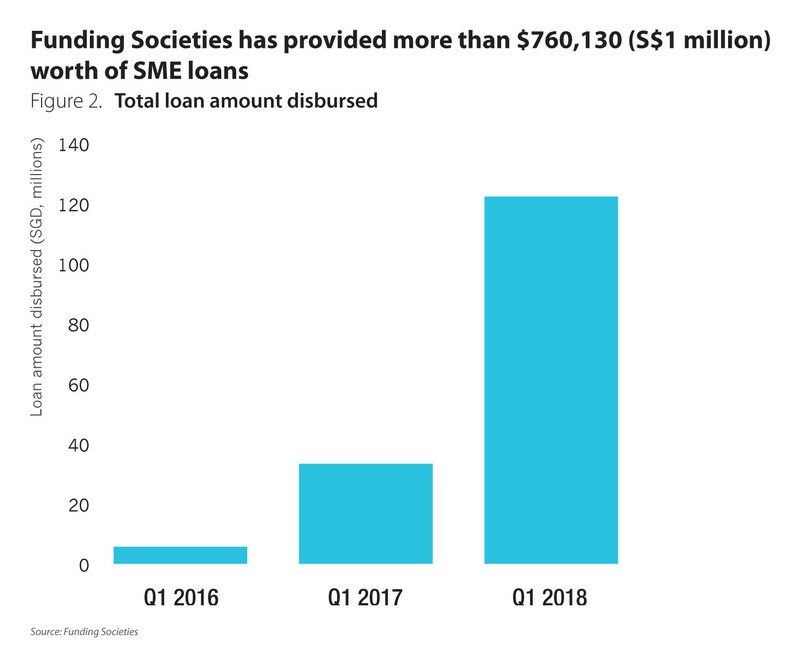 As a result, launched in June 2015, Funding Societies has grown rapidly and safely to become the largest SME digital financing platform in Southeast Asia with among the lowest defaults. Funding Societies provides business financing to underserved SMEs for their working capital and expansion needs. This is done through its digital marketplace platform where retail and institutional investors come together to lend to the SMEs. Businesses can avail loans ranging from just $3,800 (S$5,000) going up to $760,130 (S$1 million) and at reasonable rates of interest. “To scale up sustainably, we’ve developed direct and indirect channels to reach customers, of which partnership is a critical avenue. We’ve partnered with brokers, associations and banks, including at least one bank per country. We may not always partner with the biggest, but always the most receptive player to ensure a long-term win- win relationship.” Partners such as associations, standard brokers and banks are a major channel for Funding Societies as they all play a critical role in this industry. Meanwhile, in the area of customer service, the company launched in September 2017 its chatbot, Miyu, which claims to be the first chatbot created by a crowdfunding platform in Southeast Asia. Miyu was developed by two interns at Funding Societies along with bot platforms meya.ai and api.ai. Leveraging on machine learning and natural language processing, Miyu is able to address frequently asked questions as well as personalised questions. 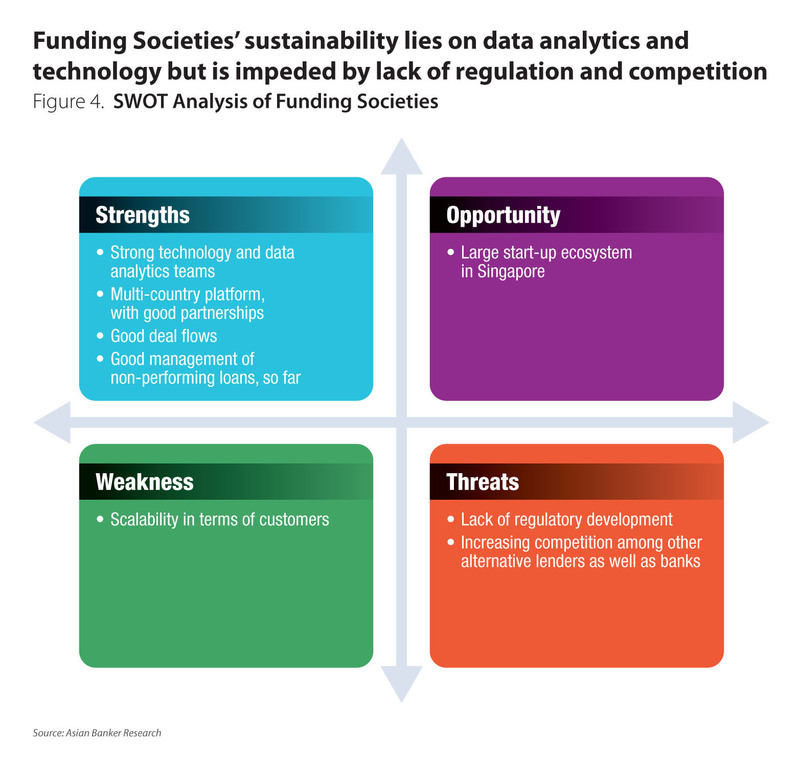 Aside from a well-designed app and user experience, Funding Societies focuses on security. It has incorporated biometrics – thumbprint for unlocking of the app and auto-locking of the app – to ensure that customer information and transaction are kept safe. It also conducts security audits annually. The company has applied tech and data not only in credit underwriting, but also in business operations to aid humans and not replace them. 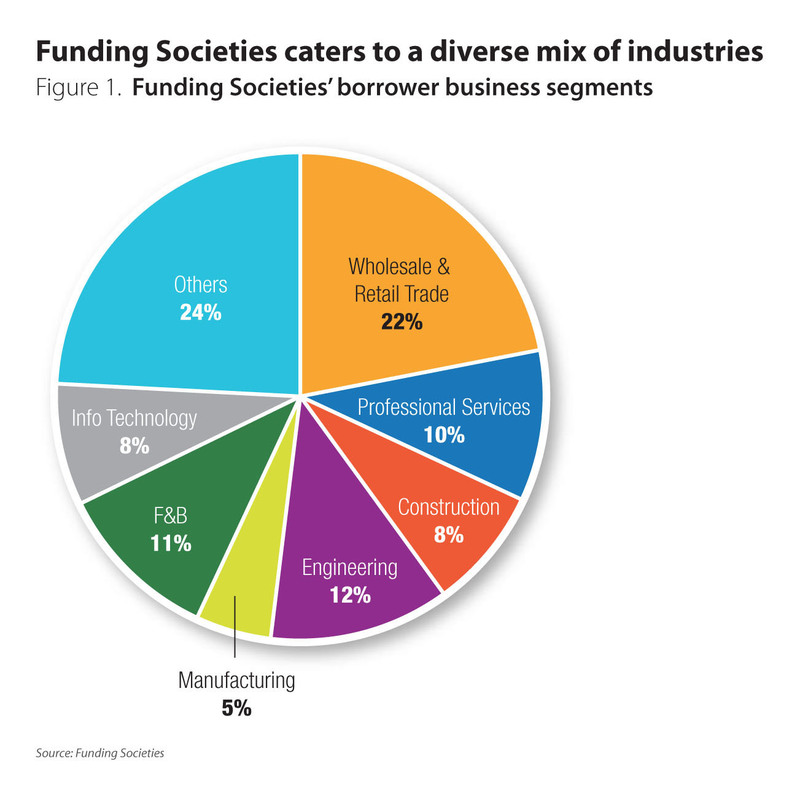 Funding Societies platform has facilitated funding across industries including Manufacturing, Engineering, Construction, Professional Services, Wholesale and Retail Trade amongst others (Figure 1). Most of the SMEs which Funding Societies has funded do not receive adequate financing through traditional options. Others have existing bank loans but approach Funding Societies for fast and short-term bridging loans. In three years, the company remains to be the only regional platform in Southeast Asia. It has emerged as one of the market leaders in the countries it covers with over $76.02 million (S$100 million) in total crowdfunded SME loans across Singapore, Indonesia and Malaysia as of January 2018 (Figure 2). “Looking at our pitch video in 2015, we had set out to be a regional player since Day 1, as we’re passionate about Southeast Asia. Hence, we do not take a half-hearted approach. We’re now the only regional SME financing platform in Southeast Asia, licensed and operating in Singapore, Indonesia and Malaysia. Based on independent data, we hold a market share of 50% in Malaysia and 30% - 40% in Indonesia in SME financing. We’re among the top players in Singapore but not a dominant leader yet, as we were 1-2 years late to market,” Teo elaborated. 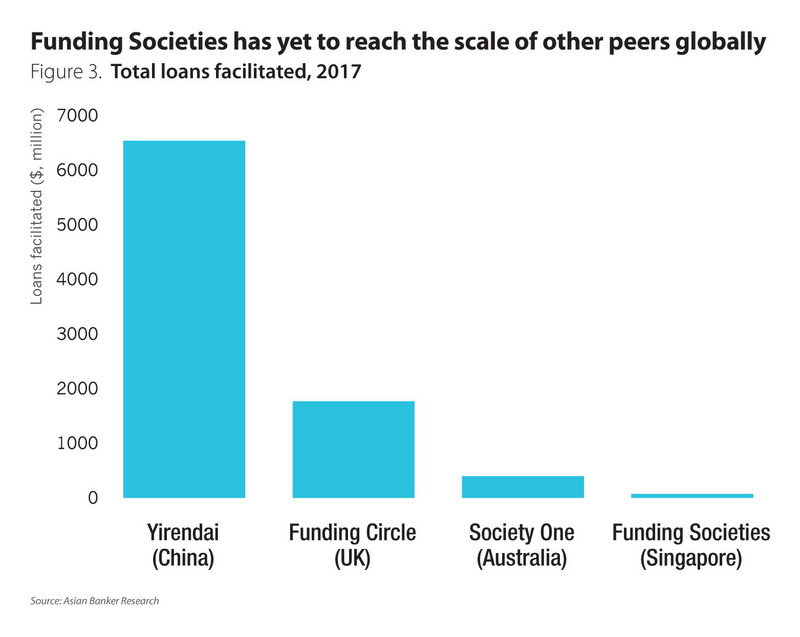 However, Funding Societies has yet to grow its loan book to the size of its leading peers globally (Figure 3). The development of P2P lending is happening rapidly at varying stages in different regions and countries. The industry has taken root especially in Singapore given the more forward approach of the financial industry in terms of technology and innovation, coupled with a thriving start-up ecosystem. 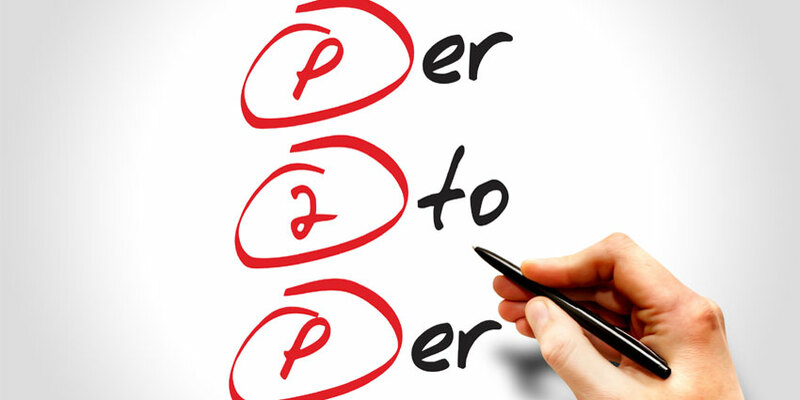 Moreover, P2P lending has been given recognition in terms of regulation. Since June 2016, the Monetary Association of Singapore (MAS) introduced a licence requirement for P2P lending platforms. In addition, companies that involves retail investors are required to apply for a Capital Markets Services Licence for Dealing in Securities with a base capital requirement of $380,025 (S$500,000) and the requirement to maintain a security deposit of $76,017 (S$100,000) with MAS. However, Teo explained that from the perspective of a P2P lender, regulation has become both a driver and a challenge in terms of further pushing the potential of the industry. “The biggest regulatory change is the existence of getting a licence to be a platform. Beyond that, it is actually the absence of regulatory change that is causing the issue. When regulations legitimate, there is a clear path towards being compliant. Before that, there is a lot of self-regulation and self-management. We are very fortunate to be licensed in Singapore and Malaysia”. “The key challenge is the lack of regulatory change especially in terms of standardisation of interest rate, and on the public to make decisions; you need to equip them with the right information. However, currently, every platform is disclosing interest rates differently and defining interest rates differently, the public is not adequately equipped to make educated decisions,” he added. It would be interesting to monitor the transformation of Singapore in becoming a more conducive landscape for P2P lending. Upstart was founded by ex-Google executives Dave Giround, Paul Gu and Anna Counselman. Unlike other P2P lending platforms, Upstart goes beyond the usual credit scoring model which looks at FICO score, credit report and income. Instead, it considers other factors such as academic variables including colleges attended, area of study, GPA, and standardised test scores to develop a statistical model to evaluate the borrowers’ financial capacity and personal propensity to repay despite limited credit and employment experience. With its slogan, “There’s more to you than your credit score”, the platform has already originated $1.6 billion in loans since its launch in May 2014. Funding Circle is a P2P lending platform launched in 2010 which solely caters to small businesses. The company claims to take a data-driven approach to assessing the credit risks and puts importance to both algorithms and human input in its rigorous underwriting process. In an article published by Vittoria Reimers, Funding Circle’s director of credit, “Human credit knowledge provides significant value to the underwriting process”, “The future of underwriting will not be taken over by algorithms and robots, but will be predicated on combining a large and rich list of data points and information with the right balance of human and algorithmic interaction”. At current, around 34,709 businesses in the UK have borrowed $4.57 billion (£3.3 billion) through Funding Circle. The platform’s annual bad debt rate after recoveries is at 2.1%. Yirendai is the largest P2P lender with one million borrowers by end of 2017 In 2017, it launched its own credit scoring system called the Yiren Score, to enhance the preciseness and accuracy in characterising its borrower’s credit profile. This strengthened the platform’s risk management capabilities. Thus, despite the regulatory crackdown for P2P lenders in China, Yirendai was able to drive strong growth and valuations in 2017.